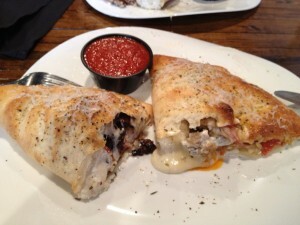 One of the most highly rated restaurants on trip advisor (downtown) is Sauce on the side, a fast, casual calzone eatery. Luckily for me, it is only a block and a half away from my hotel, so I met my friend Dana there for lunch. They offer a bunch of specialty calzones or you can create your own. We got two to share: Meet me in St. Louie - pepperoni, sausage, provel, marscapone and ricotta and the Figgy Piggy - bacon, figs, balsamic onions and mozzarella. I thought the dough for the calzones was excellent- extremely crisp and light, with a dusting of cornmeal. I even liked the marinara dipping sauce that came with the calzones. The service was fast and all the calzones are $10 or less. Mango serves Peruvian food and has a terrific pre-theater menu - $20 for three courses. There was a choice of soup or salad, four different entrées, and cake or sorbet for dessert. My three dining companions all opted for the pre-theater menu, but I decided to go à la carte with pasculina (Peruvian spinach pie), mussels steamed with white wine and garlic and an order of fries. 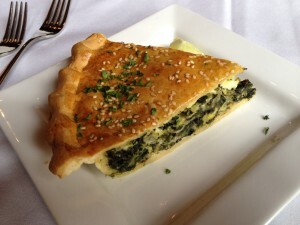 I enjoyed my spinach pie, and the mussels were good but not as great as Brasserie's. The fries were thick cut which is a refreshing change from all the matchstick fries I've been having lately. The soup and the salad got positive reviews from my dining companions. 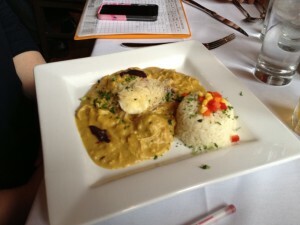 Kim got the Aji de Gallina, which was on St. Louis magazine's 50 best dishes in the city list. I thought it was good, but not award worthy. Zach ordered a pasta with three different kinds of mushrooms, onions and tomatoes. It didn't seem particularly Peruvian to me. He said he liked it but complained the portion was small, that may just be because he is a growing 15-year-old boy. I thought the portion size looked fine. Steve's Lomo Saltado was a stir fried steak dish that seemed more Asian than Peruvian. He seemed to enjoy it, regardless of its ethnicity. 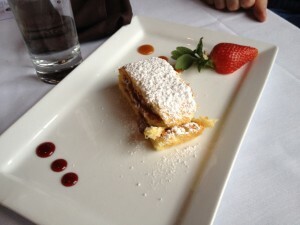 Dessert was a sponge cake filled with Dolce de Leche and mango sorbet. Luckily the Dolce Vita Leche was creamy, rich and sweet Because the dry sponge cake needed the help. The mango sorbet was fruity and refreshing. 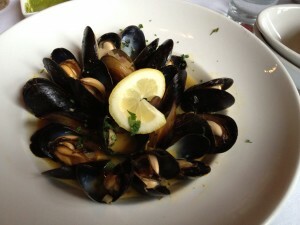 Our service was good and the prices were quite affordable, especially with the pre-theater menu option. Rooster is part of the same empire that includes Bailey's Range, and Bridge Tap and Grill. 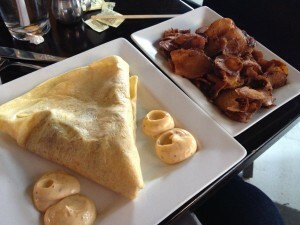 It is an upscale breakfast joint that specializes in crepes and scrambles. 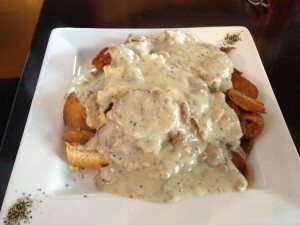 My dining companion got the rooster slinger ($9.5) - It looked like a car accident on a plate with andouille sausage, potatoes, eggs on thick cut toast topped with a sausage gravy. Presentation aside, Mike seemed to enjoy it and finished almost all of it. I got a breakfast crêpe of egg, bacon, and Vermont cheddar. I thought it was excellent, although a little pricey at $8.75, not including my breakfast potatoes which were $1.75. I think it is a great breakfast option if you're in the area. My friend Marc has already been there four times this week. It is amazingly appropriate that there should be a wine bar called Bridge, 3 blocks awayfrom the tournament. Steve made it his headquarters for the week and so for most nights, after the game, he would head there for a glass of wine and some nibbles. We got a variety of popcorn, smoked paprika, spiced chai, and mocha espresso. We have also tried a variety of their spiced nuts. I'm told their pretzel bites are delicious as well.